Repeated deaths at same intersections suggest design changes needed. 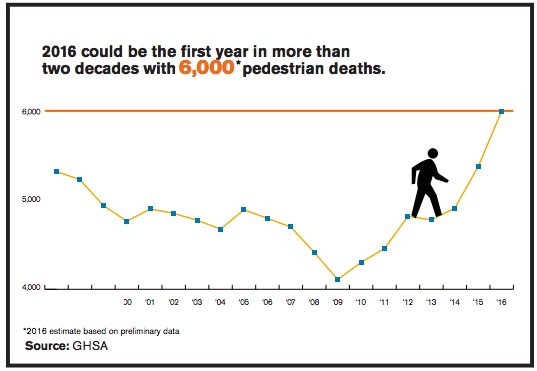 In Wisconsin, final figures for 2016 aren’t available, but pedestrian deaths are up since 2009, when the total was 35, to 42 in 2014 and 55 in 2015. I guess that the DOTs haven’t seen any of Urban Milwaukee’s suggestions for improving intersections. Just add some turn lanes, eliminate parking, and make sure to use plenty of green paint to show the cyclists they’re welcome too. Oh wait, that’s the same play that the DOTs have been using since the 1950’s sans the green paint. So now we have to redesign streets and spend tax payer money that doesn’t exist in order to keep people alive who are too addicted to their phones to look up. While I actually support pedestrian friendly street designs, it is mind boggling how stories like this ignore the obvious. Drivers have smart phones. Just stating the obvious here. Re-designing streets is to protect other users from those drivers. You got a better idea? I’m sorry, but the tragic pedestrian deaths in MIlwaukee are not due to street design or what color paint is on the roadways. Milwaukee’s vicious hit and run pedestrian deaths are mainly due to people who openly disregard traffic laws. They speed excessively to the point of losing control of their vehicles, run red lights and stop signs, and just don’t give a damn about anyone but themselves. Good luck with trying to find many…or ANY, for that matter, who have valid drivers’ licenses or “mandatory” insurance. The pedestrian death that happened about two weeks ago and half a mile from where I live was caused by a selfish b***h who was fleeing from another injury hit and run she had caused. The driver then caused another accident less than a minute later. The pedestrian was wedged under her vehicle. She was driving back and forth over the pedestrian’s body, trying to dislodge the body!!! When bystanders wedged rocks against her tires and immobilized her, she got out of her vehicle and walked away, talking on her cell phone; no doubt looking for a ride to flee the scene!!! The brave bystanders called the police and followed her. The victim was a woman in her 50s who lived a couple of blocks away from the scene and was well known and loved by many. She frequently took walks in her neighborhood. Just plain sad. I’d imagine that distracted driving is at least as much to blame as distracted walking. It’s frankly scary to look around at drivers (especially when riding the bus and sitting high enough to easily see into nearby cars) and see how many are looking at phones. MKE Kid is spot on. There is a culture of reckless driving in this city, and it’s caused entirely by lack of traffic enforcement. 6th & Wells in all directions is a major problem spot. Latest traffic performance art I witnessed there was a South-bound driver in the far _right_ lane of N. 6th St. using the 2-3 seconds between lights to screach from a dead stop into the open intersection, cutting _left_ onto East-bound Wells Street – across 6 lanes of traffic and heading screaming under the Wisconsin Center to the next light. Pure macho punk driving. First thing I noticed as a pedestrian was that I couldn’t see the driver through the tinted vehicle windows.